“Until very recently, I thought of Mass like a simple festive meal. However, entering church one day, I came across someone praying in front of the Blessed Sacrament, to which, I confess I had been quite indifferent until then. This young man experienced complete spiritual renewal not through theoretical discourse but through an encounter with another person inhabited by Christ. His true Presence in the heart of another person is so unmistakable and powerful that it radiates through them, touching others. It is a manifestation of the abundance of Jesus’ love which he wanted to extend to all humanity. This Sunday’s gospel reading reveals to us the secret of this love. Mark describes it in such succinct style, making Jesus’ acts and words stand out with even greater luminosity. Bible specialists agree that Mark “offers us a unique connection to Jesus and the atmosphere of Galilee. He brings together all the actors of the early church.” He resonates with the energy of the first days of evangelization. On the surface, this Sunday’s story could be read simply as a meal for which, since it’s Passover, Jesus wants to make more of an occasion by organizing a room. And don’t we share this concern for presentation and ceremony in contemporary society? It would be easy to read over this event too quickly and neglect the grace it contains. Christ asks: “Where is the guest room where I can eat Passover with my disciples? Prepare it for us there.” The “I” and “us” underline this fundamental uniting moment. Everything here is specific and draws anew in the gift of Christ’s sacrifice for all mankind. Jesus says to his friends again: “This is my body, this is my blood.” From that moment on, everywhere the Eucharist is celebrated, there stands the temple of his Body. Forging the new alliance with his body and his blood, Christ gives himself to us to receive him and commune with God through him. 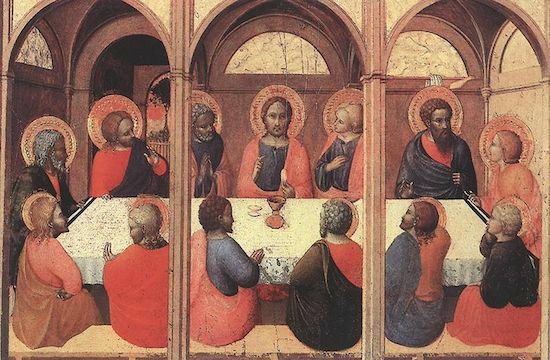 So, if Mark, in his Gospel, doesn’t seem to identify the meal which culminates with the Eucharist so clearly as the others, it is perhaps to guide us to a precious lesson: Christ’s power is in his transformation of the ordinary. This returns us to the earlier realization related by my fellow believer who, until then, saw only the ordinariness of Mass. Conversion waits for us in the most unexpected places. It is through Christ that holiness enters our lives. Because he is Life, he offers it abundantly. We would need the simplicity of saints to grasp the ungraspable power of the sacrament of love. May this festive Sunday show us how much it pleases God to nourish ourselves with his energizing Presence, and to speak to us with his commanding Word. May we wake up and see clearly! This is not an ordinary meal. He who gave himself to save the world is present among us. He stirs within us the hunger which only He can satisfy. He transforms the darkness within us, bathing us in his light and true Presence.